Ravana story: Ravana meet Vamana! He stood, as a servant, with the Gada in His hand. It is said that Bali’s palace in Sutal Loka, had twelve entrances. Ravana once went, to fight Bali. 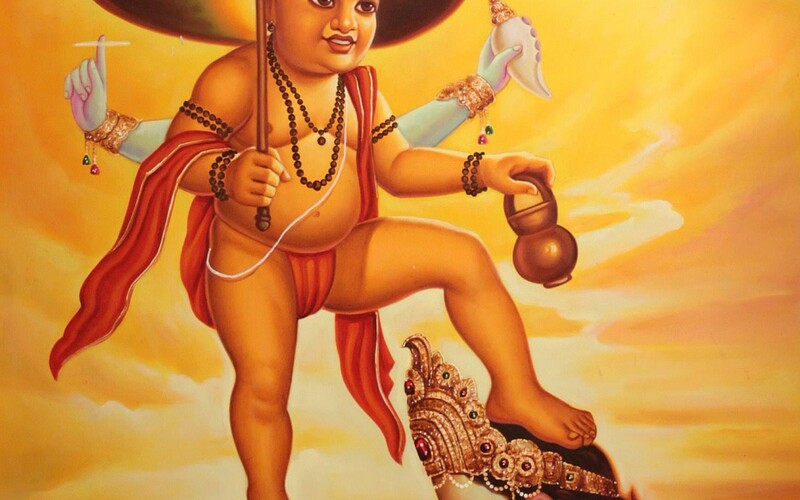 When he reached Bali’s door, he found a dwarf guarding the entrance, with a gada in his hand. He saw the same Vamana guard every entrance he went to. Vamana replied that this was not the right time for him to enter. Ravana threatened to physically lift, and throw Vamana aside. Hearing this, the Lord pushed Ravana with the toes of His left foot. Ravana was thrown from Sutal Loka to Lanka. He never again attempted to face Bali. This story shows that no matter how many vicissitudes come into the life of a person who does bhajan of the Lord, he ultimately gets everything. By the Lord’s Grace, Bali got glory, luxury, protection, satsang, and also the position which had been taken away.